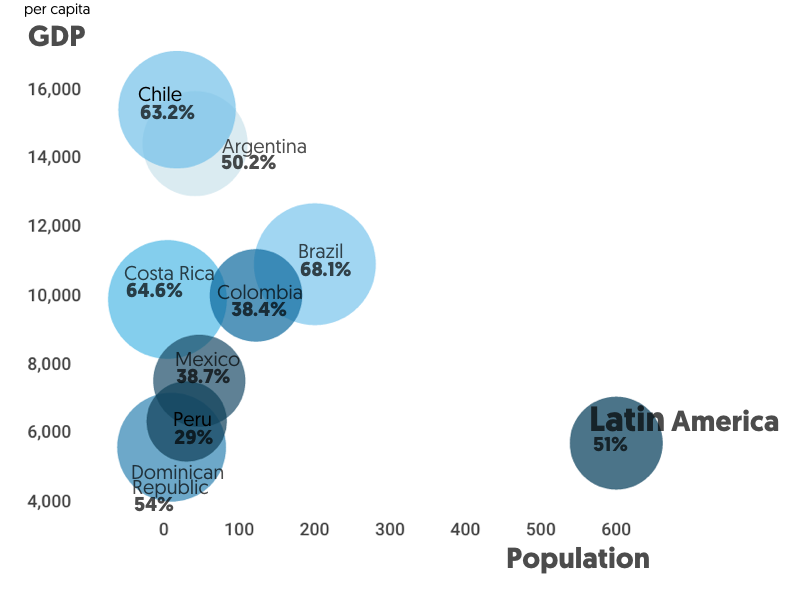 What’s Driving eCommerce Growth in Latin America? In the year 2000, internet penetration in Latin America was in the single digits, hardly reaching 3% of the population. In less than two decades, 56.6% of its population has gained access to the world wide web. Despite the existence of a substantial variation in the internet penetration across countries in the region, Latin America’s total population connected to the internet represents more than 10% of the internet users in the planet. The internet has certainly become a disruptive force that empowered Latin Americans and revolutionized the market in a number of ways, laying the first stone for ecommerce, which is acting as a catalyst for urgently needed innovation and technological development, an area where Latin America lags behind other regions of the world. An expanding middle class with an increasingly sophisticated taste. Today Latin America is home to 600M people. The booming economies in the region have taken decisive steps to shrink the income gap and pushed over 70 million people out of poverty in the past decade – a population larger than that of the United Kingdom. At the same time, Latin America has been adding more citizens to its pool of middle-income earners at a faster pace than other regions in the world, expanding its middle class by 50% since the past decade. Today the middle class accounts for one third of the population, totaling 200 million people. This new middle class is an avid user of the internet, its consumption needs keep increasing in sophistication and remain unsatisfied by the local supply of goods and services, hence, turning to a more diverse global supply of goods & services via ecommerce. Ecommerce still represents a small fraction of the total retail sales in LatAm but it is expected to keep growing as its ecommerce conditions continue to improve. 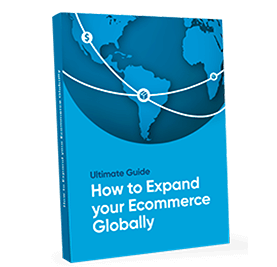 Ecommerce sales grew 22.9% in 2015 in Latin America. 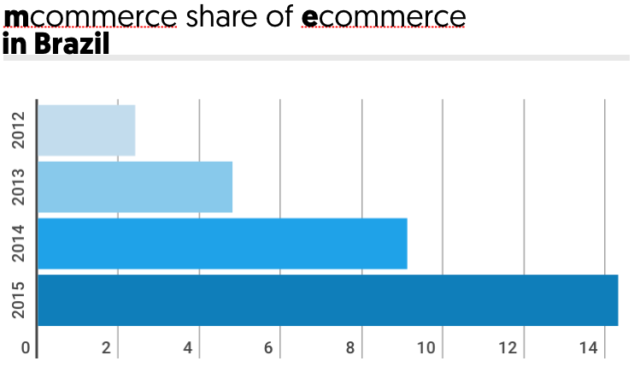 There is still abundant room for ecommerce to expand its market share of the total retail sales. As digital audiences continue to grow and improvements to ecommerce payments system and shipping continue to be made, Latin America is poised for ecommerce. In Brazil for instance, ecommerce is still growing in double digits, despite its economic recession. Non-banking institutions take the spotlight. Latin America is a region where the banking sector roots penetrate deep into the economy, but not as deep to reach the lowest income population. A decade ago, non-bank issued electronic money was unthinkable. Traditionally, in Latin America, money is an exclusive business of banks. An idea perpetuated by regulatory agencies until recently, resulting in large financial exclusion across the region. The latest report from the World Bank reveals that the banked population of Latin America grew to 51% in 2014 from 39% in 2011, a significant increase, but only in 5 countries the banked population is at least 50%. Non-banking institutions providing financial services. Many of the innovations emerging in Latin America stem from non-bank startups providing financial services like ewallets, credit cards and prepaid cards, taking advantage of the high demand for eMoney services and a growing connectivity from mobiles and desktops. Startups like EBANX are a key component in the development of new financial technologies. The combination of our lean, nimble operating model and a can-do attitude allows us to see opportunities and act on them more quickly than traditional banking institutions. Being able to offer an array of payment methods to serve the underbanked eShoppers across Latin America as well as global merchants who want to expand their ecommerce reaching a wider audience. Although advanced economies boast much higher smartphone and mobile internet penetration rates, latinos are well ahead of their wealthier counterparts in using their handset to shop. Latinos are mainly mobile-first, meaning that the mobile handset is the first web-enabled device accessed by consumers. The importance of a mobile phone is often a necessity rather than a choice. Laptops and PCs are simply found in fewer homes. In 2015 according to the 27th Annual Research on IT use in Business by the Fundação Getúlio Vargas the number of smartphones in use, surpassed the number of computers in Brazil, 165M smartphones against 160M computers, 48.3% of those smartphones are in the hands of the middle class. Brazil, Mexico, Colombia & Argentina – The largest mobile phone markets. In Brazil, 14% of ecommerce sales are done from a mobile phone. According to a 2014 report by Deloitte Digital, Brazil is the global leader in retail sales influenced by mobile devices, driving 40% of its ecommerce site traffic and the mobile Internet subscriptions in the country increased by almost 1,500% over the 2009-2014 period. It is estimated that this year, 64 million people in Brazil will use smartphones, making up about 33.8% of the smartphone population of Latin America. Mexico, meanwhile, will be home to 44.2 million smartphone users this year—about 23.3% of the total in the region while Argentina is the No. 4 smartphone market in the region, with around 9% of users, just behind Colombia, which has about 10% of the total.